The 2011 conference ‘Four Degrees or More? Australia in a hot world’, held in Melbourne, explored the likely consequences of rapid global warming for Australia and its region. 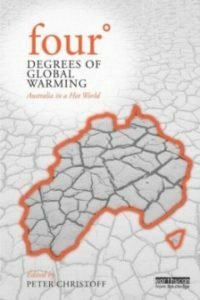 Now, the newly-published book ‘Four Degrees of Global Warming: Australia in a hot world’, edited by University of Melbourne Associate Professor Peter Christoff, provides an update of the expected consequences of a four-degree world. On 4 December 2013, CSIRO’s Dr Mark Howden and Dr Penny Whetton, who are co-authors of the book, presented the recently published book at Melbourne University. The book summarises the most recent research on potential impacts of global warming and explores the implications and possible responses to climate changes that are at the upper end of projections for Australia and its region. It provides a detailed examination of the likely impacts on Australia’s social, economic and ecological systems. These latest research results can help us understand how climate change may affect our lives so we can start to prepare accordingly. ‘Living in our land of droughts and flooding rains, Australians have climate issues embedded into our culture, our activities, our economy. Climate is part of our national psyche. All of these things will be impacted by a warming of 4 degrees. This book spells out how,’ said Dr Howden, CSIRO. ‘Four Degrees of Global Warming’ was written by many of Australia’s most eminent and internationally recognised climate scientists, climate policy makers and policy analysts, including four CSIRO authors. In chapter 2 – Climate science and four degrees – CSIRO’s Dr Penny Whetton and colleagues explain that we may experience average annual temperature increases of about 3°C to 5°C in coastal areas and 4°C to 6°C in inland areas. We may see likely decreases in annual rainfall in southern Australia of up to about 50 per cent (particularly in winter) and under a high emission scenario no more snow in most alpine regions by the end of the century. Dr Whetton’s work shows that in the mid to drier end of the climate model range, Perth, Melbourne, Adelaide and Canberra may adopt climates more typical, at present, of the semi-arid interior. Currently agriculturally productive sites like Dubbo may experience a climate typical of the current semi-arid to arid zone. East coast sites of Sydney and Brisbane would experience climates now experienced at least a thousand kilometres northwards on the coast. Dr Penny Whetton of CSIRO’s Climate Adaptation Flagship and a co-author, speaking at the book launch at the University of Melbourne. Dr Kevin Hennessy investigates changes in extreme weather events in chapter 3. His research found that under a high emission scenario Australia is expected to experience a large increase in extremely high temperatures, extreme fire weather, extreme rainfall events, tropical cyclone intensity, extreme sea levels, droughts in southern areas and hail along the east coast. A decrease in the frequency of extremely cold temperatures is expected, along with fewer tropical cyclones and a reduction in extreme winds and hail in southern Australia. Dr Hennessy warns that these changes may pose significant challenges for disaster risk management, water and food security, ecosystems, forestry, infrastructure such as transport and energy, as well as health and tourism. Australia’s marine resources in a warm, more acidic ocean are being investigated by Prof Ove Hoegh-Guldberg, from the University of Queensland’s Global Change Institute and CSIRO’s Dr Elvira Poloczanka in chapter 5. Australia’s ocean territory covers 16 million km² – almost twice the size of its land area and supports valuable industries and globally important ecosystems. Dr Poloczanka warns that many species will not be able to keep up with the rate of climate change. For example, coral cover on the Great Barrier Reef would be seriously diminished, with grave consequences for GBR fisheries and tourism. Ocean fisheries may be transformed with some regional stocks collapsing and others moving. Chapter 5 highlights that marine resources are central to the well-being and food security of people throughout South-East Asia and the Indo-Pacific region. Risks posed by climate change to the economies, livelihoods and security of the region will impact Australia, given Australia’s economic and development role in the South Pacific region. Dr Mark Howden explores agriculture in an even more sunburnt country in chapter 6. Dr Howden’s research investigates how 4°C of warming may affect both national and regional economies that depend on the agricultural sector. His work shows that increasing temperatures will increase evaporation and the degree of dryness in the air, cause damage during crop flowering periods, reduce river flows and irrigated agriculture, change the severity and location of pests, diseases and weeds and reduce rainfall across the key agricultural areas in southern Australia. Dr Howden explores how these factors may reduce productivity, lead to changes in land use and affect global food security. Dr Howden provides an overview of opportunities to both adapt to climate change and to reduce greenhouse gas emissions that have been explored by farmer groups and researchers, and how this work has identified a range of possible options which enhance both productivity and sustainability. The book can be purchased through major online and in store bookshops.